Final thing on the car-culture regression. Below is a comparison of the actual data on Vehicle Miles Traveled with my reconstruction of Nate Silver’s model, and my model including lagged gas prices, housing prices, and the stock market. 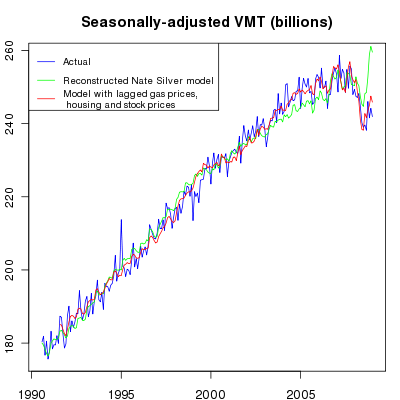 I “seasonally adjusted” the miles data by fitting a model predicting miles based only on the month of the year. The miles data (whether the actual data or the prediction from a model) is then corrected by subtracting the coefficient for the month it was collected. This data is normalized according the level of driving in April. An even better fit is possible with a more complex model that includes a) average monthly temperatures and b) an interaction between gas prices and time. But this simpler model suffices to show that Silver’s original finding was probably an artifact of his failure to control for wealth effects and the lagged effect of gas prices. The lesson, I suppose, is: beware of columnists on deadline bearing regressions!